It’d be safe to assume that Joey Gallo and Nomar Mazara are friends, as they’ve played on the Texas Rangers together for four seasons and love to mash taters, but as this post-homer celebration shows, they’re really good friends. 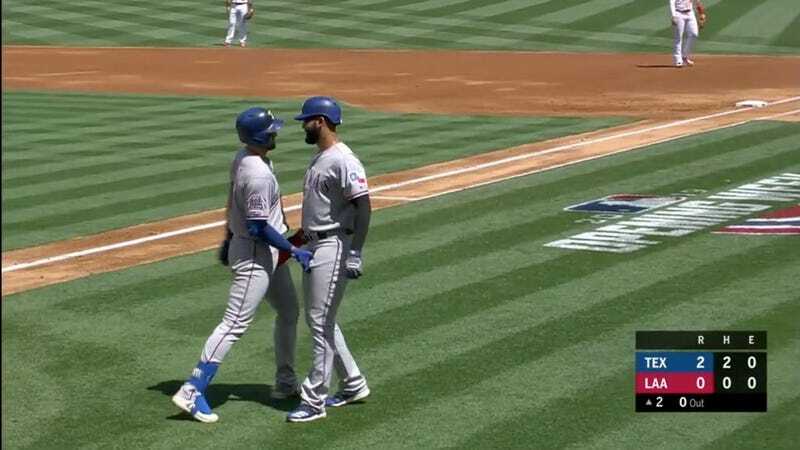 In Sunday’s game against the Angels, Gallo hit a two-run blast to drive in Mazara, so the pals celebrated at home plate with a little handshake that ended with a mutual crotch grab. Adrian Beltre would blush at that head touching if he were still playing. The Rangers couldn’t score more than that pair, as they lost 7-2 to Los Angeles. At least those nutty buddies made them count.